The frustration that prompted the “Bernie or Bust” movement is not just about economic stagnation. Rather, it is more basic, more institutional-centered, than that. From the viewpoint of progressives, there is in addition a frustration with the once liberal, now neoliberal political philosophy and its supporters, many of whom hold political office. This includes the presidential candidacy of Hillary Clinton. For many voters from the left, liberals have become institutional custodians: they are, to use a Marxist term, “bourgeois liberals,” or, as Chomsky refers to them, the “liberal intelligentsia,” whose primary task is to protect institutional processes, structures, and interests, over all other norms and goals. Those who have taken it as their task to tend to institutional mandates and goals seek to marginalize and minimize all ideas coming from outside the institution by delegitimizing them in comparison with the goals and procedures of institutional structures, and using those structures to slow them down and/or send them to institutional black holes. These institutional guardians learn to minimize or lose the ideals they begin with, by submitting them to institutional processes whereby their moral values are streamlined, trimmed, and changed in their function, form, and normative ends. In this essay, “institution” means “government,” but it could apply to any institution, such as academia, the media, Democratic Party, or business. Such bourgeois liberals are opposed by the visionaries, who frequently today self-reference as “progressives. They are the challengers to institutional prerogatives and functions, who are aware that institutional curators do not understand the language of morality, but rather comprehend pragmatism over values, the protection of the institutions of which they are a part, and even self-interest within the confines of the institution. An excellent example of this dialectic can be seen in the heated debate that occurred between former Congressman Barney Frank and Cornel West, on the July 26 edition of the show “Real Time with Bill Maher.” While West argued that the issues that confront us, such as climate change and deep inequality, require revolutionary and immediate change, Frank argued that such a vision not only did not cohere with an institutional arrangement (i.e. American government) that prefers “slow as you go” and “institutional change only” [my summary phrases, not quotations from Frank], but that institutional procedures regarding specific issues were the only way to make changes in people’s lives. Mr. Frank even devalued Jill Stein’s candidacy for President on the basis of her lack of making institutionally-approved changes in her political career! Even more, Frank’s listing of Democratic—and specifically Bill Clinton—programs that were successful for citizens ignored that they were moderate gains at best, and clearly offset by Democrat—and Clinton—programs that were at odds with equality and improvement for all. For just one example, the Clinton demolition of the welfare system kept their institutional (corporate) masters happy and kept Bill in office, while completely betraying the interests of a large segment of the populace. Other examples abound. A bit to the political right of these “institutional liberals” are institutional conservatives such as the Karl Rove type. The difference between Karl Rove’s conservativism and a liberal, with regard to institution-caretaking and power distribution, is that Rove seeks to determine and present people “their” vision for their activism (through propaganda), thus “allowing” the political leaders to “follow” by “capitulating to the will of the people” and thus manipulating the system through its current configurations and structures in order to obtain the ends of power sought by the propagandists to begin with. Liberals within the system advocate for and seek to “allow the system to work,” while simultaneously eschewing the vision of the activists pushing for deep systemic changes, and also to a degree using propaganda to slow the people’s push for change so that it doesn’t leave the control of the institutional wardens—i.e. liberal defenders of institutional processes and prerogatives see to it that the people don’t “get out of the control” of the system’s defenders. This was clearly seen in the tensions between the Sanders and Clinton supporters during the Democratic Convention. Contrary to the Party liberals who currently control the DNC, progressives seek to consolidate the vision of the people outside of the system (i.e. the “grassroots”) into an overall mandate for systemic change itself, the vision of which cannot be comprehended and bound by systemic and institutional concerns. This is where the value and role of a third party comes into play: to unify progressive voices into a whole both by analysis of institutional problems and by designing and promoting activist programs intended to change institutional abuses and lethargy regarding moral values, especially values of human dignity and equality. One appropriate method of such institutional analysis is to point out those (factual) institutional structures which lead to or entail contradictions in practice or in the stated ends of the institution. This is the empirical, and specifically the Marxist or socialist model of analysis. Therefore, realpolitik is the model of action inside the institution itself as well as between institutions, but it is outside of it that the main source of moral limitations to institutions originates, in the women and men who have not compromised nor surrendered their voice of conscience to the sources and means of institutional power by “following institutional processes and procedures,” thus maintaining the status quo, while only tinkering around the edges of the institution from within and in crafting appearances of movement forward, all the while maintaining the same processes and values called forth by the institutional dictates that necessitated the moral push from the outside to begin with. If the people “outside” fail to set moral limits and pressure institutional members with those limits, the institution will deepen its corruption and its power over its people, by succumbing to whatever forces exist that can and will fill the vacuum left by the withdrawal of the moral limits from outside (usually power and wealth). Those within the institution who do have any conscience, limit and nuance its voice when they become players in and thus components of institutional structures, processes, and mandates. Hence, the ongoing need for a unified external moral voice, not yet another (“third”) party seeking to get into an institutional system that will ultimately either force the party and its members into significant moral compromise or destroy the morality of the party that propelled them into the institution to begin with. The trail of justice is littered with the corpses of those who, with full moral conscience, entered into the institution to attempt to change it. Thus, while in this election cycle a third party choice would seem to be an obvious need, it should seek to represent not a genuine alternative for taking the reins of institutional power, but rather should serve as a statement of a unified moral vote against the status quo; a message to those within the institutional halls that they are not safe in their comfortable roles as institutional tenders and servicers if they do not heed the distinctly moral voice of the outsiders, the citizens. If the institution continues to fail to listen to the clear moral voice of the people outside it, then the casus belli for revolt against it has already been clearly and directly given to the people. But as argued here, the revolt will not succeed by sticking a third party into a corrupt institution, but by using the third party to push those in the institution to listen to the voice of institutional change, or be removed. It threatens the neoliberals with political extinction in the face of the threat of human extinction from climate change, and from the immoral policies of neoliberal and Republican economic and social elitism. It tells the world that the people are prepared to “go it alone” and to take on the institution more directly if need be in the process, in order to preserve and protect humanity and to bring about a more equitable society in the face of the extreme imbalances we see today, both in the world and in the halls of institutional power. This is the duty of the citizens of any republic, and third parties can help citizens perform those duties by uniting their voices. So yes, we need a third party, but not to play the role that people frequently think. Rather, the role of a third party will be to alter the breadth, role, function, and process of the institution itself, to force those who service the institution to serve instead, or primarily, the people they pretend to serve, but to whom they perform that service minimally or not at all. Such change never comes from those within the institution itself. So, most importantly, the surest way to end a third party revolution is to put the party into an institution whose power is already absolute and whose corruption is complete. A third party’s function is rather to lead the way to an overturning and revamping of power structures that is far overdue. This is not something a simple movement within an institutional party could or would accomplish. Revolutions are not done from within a system, and are not done in one election season, nor under the leadership of those whose primary allegiance is to their institutional position and party. Such leaders surrender to the institution quickly, as we have seen with both Obama and Sanders. Change can only come through a people unified in their vision, yet with the knowledge that they are not only outsiders to the system, but also know that the degree to which institutional parties and corruption are entrenched in the system imply proportionally the amount of time it will take to batter down the institutional walls in order to open its doors to the people. Third parties lead the way in this by helping everyone to get their hands on the battering ram of the moral vision of human dignity and equality that will bring fear to the entrenched parties and their corrupt bosses, as their secured institutional walls and doors begin to quake from the force of the people. If change is what people want, third parties are the only way to get it, and the winning attitude is not to expect to put third party people in office. When people like Barney Frank and others, especially Democrats, say of Jill Stein “but she can’t win,” they are expressing the fact that they have already capitulated to the institutional system as it is. The right attitude is that “win or not, we’re demanding change, and we’re not leaving until we get it.” That is the attitude of those who participate in third parties. That is the attitude that over time cannot lose. 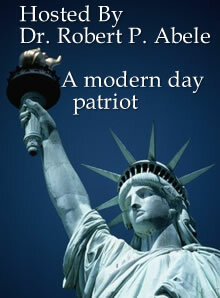 Dr. Robert Abele (www.spotlightonfreedom.com) holds a Ph.D. in Philosophy from Marquette University and M.A. degrees in Theology and Divinity. He is a professor of philosophy at Diablo Valley College, in California in the San Francisco Bay area. He is the author of four books, including A User’s Guide to the USA PATRIOT Act, and The Anatomy of a Deception: A Logical and Ethical Analysis of the Decision to Invade Iraq, along with numerous articles. His new book, Reason and Justice, is forthcoming (2018).